This week, I saw the movie 12 Years a Slave. Most of the reviewers have stated that the move is a hard one to watch, but that they were glad they did. That pretty much sums up my reaction to it. The violence in the movie is limited, but what is shown is brutal and realistic. 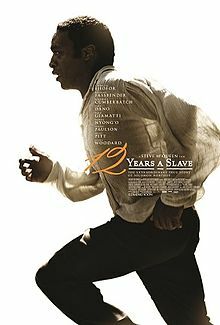 Unlike the Quentin Tarantino movie, Django Unchained, the central figure in this movie, Solomon Northup, is based on a historical person, so he’s not a superhero. This isn’t a tale of someone who gets in gunfights, but of just an ordinary guy who gets kidnapped and sold into slavery, and holds up as best he can over the years, before eventually convincing a sympathetic person to write his family so they can secure his release. The ugliness of slavery is shown in full force in the movie, from the slave markets that split families, to the whippings in punishment for crossing the (often brutally fickle) slave masters, to women slaves being raped by their masters, and to lynchings of slaves who tried to escape. In one scene, Northup starts to attempt to escape, but comes across a lynching and is unnerved enough to abandon the attempt. But we should remember that slavery was an institution local to the south only toward its end. A century before the American Civil War, it was pervasive among the colonial powers. There were abolitionists before the industrial revolution, but they were only able to gain traction once the economic incentive for slavery started to dry up. The American south was unlucky enough to have an economy that still benefited from slavery. And it wasn’t the last region in the Americas to abolish it; it persisted in Brazil until 1888. We should also remember that slavery’s disappearance as a legal institution is an example of humanity changing, and take heart that it is possible for us to change in other ways. This entry was posted in Zeitgeist and tagged 12 Years a Slave, American Civil War, History, Slavery, Solomon Northup. Bookmark the permalink. Yes, this was a very hard movie to watch. Sounds like you got some of the many powerful lessons it held. Good post! (Traveling) so terrible mistake became a terrible reality. (ends of the universe…) and it was simply supposed to be: (impressions from the edge of the Universe) and ended up on the actual end of the universe! Steve once wrote very wisely… use your blog, so make sure you don’t miss anything interesting! … so universe seems to have stopped… darkness, silence, emptiness… but fortunately, everything returns to normal… so welcome, Michael! Thanks Stan! I actually had intended to try to blog while I was on the road, but found I didn’t have the time or energy to do much more than hit the Twitter share button from time to time. It was good to have a break but I’m glad to be back.